A short-duration GRB 160702A has been detected by Konus-Wind, INTEGRAL (SPI-ACS), Mars-Odyssey(HEND), and Swift (BAT) at about 44544 s UT (12:22:24). The burst was outside the coded field of view of the BAT. The error box area is 1320 sq. arcsin, and its maximum dimension is 1.194 deg (the minimum one is 22 arcmin). The Sun distance was about 121 deg. The short GRB 160702A (IPN triangulation: Hurley et al., GCN 19666) triggered Konus-Wind at T0=3D44544.054 s UT (12:22:24.054). 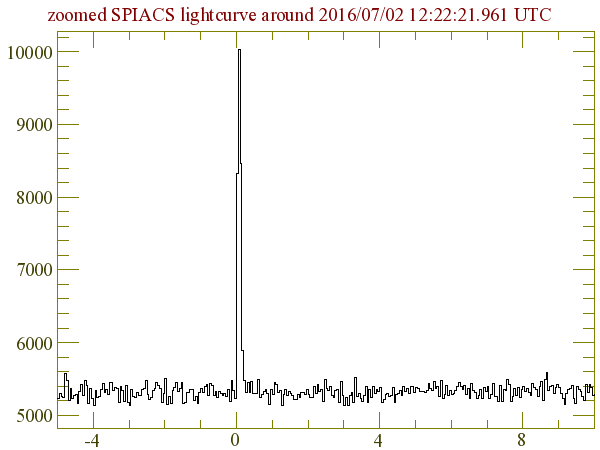 The light curve shows a short, hard pulse with a total duration of ~200 ms. The emission is seen up to ~5 MeV. As observed by Konus-Wind, the burst had a fluence of (2.5 =B1 0.7)x10^-6 erg/cm2 and a 16-ms peak energy flux, measured from T0-0.016, of (3.0 =B1 0.4)x10^-5 erg/cm2 (both in the 20 keV - 10 MeV energy range). The spectrum of the burst (measured from T0 to T0+0.128 s) is best fit in the 20 keV - 10 MeV range by a cutoff power-law (CPL) function with the following model parameters: the photon index alpha =3D -0.28(-0.35,+0.48), and the peak energy Ep =3D 782(-186,+308) keV, chi2 =3D 32.3/31 dof. Fitting this spectrum with the GRB (Band) function yields the same alpha and Ep with only an upper limit on beta of -2.1, chi2 =3D 31.9/30 dof.